This entry was posted in Uncategorized and tagged AJ Miller, Divine Truth, Jesus on December 29, 2018 by Mary. ‘Developing My Loving Self’ 2.1 & 2.2, both sessions of our second group in the ‘Education in Love’ Assistance Group series, are now available for viewing on YouTube. If you are watching these for the first time, or if you are reviewing them after your own attendance at one of the groups, my tip for gaining a well-rounded take on the concepts involved is to view the individual presentations from group 1 & 2 together. That is, after watching the first talk in group 2.1, proceed to watching the first talk (of the same name) in 2.2. Then move onto the second talk in 2.1. When you watch the second talk in 2.1, you can follow that with the second talk in 2.2, and so on for the entire programme. Each group’s questions and interactions with Jesus really bring out different elements in the theme of each presentation. This allows the viewer to more fully grasp the foundation material before hearing about its application in other areas. And if you are needing inspiration to launch into watching this material, here is an individual presentation from group 2.1 that is powerful on its own. This entry was posted in Facade, Groups, Inspiration, Jesus and tagged addiction, AJ Miller, Change, Childhood Trauma, Facade, Fear, Healing Emotional Pain, Jesus on August 1, 2016 by Mary. I was going to start by saying July wasn’t one of our best months. But upon further consideration I think it’s more accurate to say it wasn’t a fun month. It was a month of facing challenges (me), embracing new truth (me), speaking up (both of us), making solid decisions (both of us), and taking positive action in line with the kind of relationships we both desire. So, in reality that is actually very good use of a month of time. As I wrote this update a definite theme relating to relationships emerged. In fact there are so many lessons and principles illustrated throughout the latter sections on our relationship and family visit that to start with I’m just going to do a quick round-up of general news and offer our thanks to those of you who donated to us in July. Thank you very much; we really appreciate you and your generosity. During July most of the finishing touches were added to our new studio. The desks and benches were installed and Lena, Igor and I gave the place a thorough cleaning top to bottom. There are just a few minor jobs sealing up the outside that will be completed this week and then we are ready to move our equipment in. We will then start the process of testing the sound and may have to create a few sound absorbers to reduce any echo that may be there. We hope to be operational by the end of August and Jesus and I are really looking forward to creating some regular content for you all. We have SO MANY topics we want to discuss. Even if we talked for 12 hours a day for the next year we still wouldn’t be through all of what we want to catch up on. Needless to say we won’t be talking for 12 hours a day for any period of time so we will just take it slowly and make sure what we do create is of a high quality in terms of content and technical production. Jesus has still not had a chance to do an update to the website but that should occur in August. We now have 269 clips on our clips channel. These clips are all searchable via the YouTube channel so I hope you find them useful. The tagging on these clips is quite thorough so if you are looking for truth on a certain topic you will find that the search function embedded in the page is very useful. For example, you can simply search words like ‘vegan’, ‘partner relationship’ or ‘return of fourteen’ and you will come up with a variety of clips from different talks where Jesus has discussed these specific topics. This nifty screen shot from Lena & Igor shows you where the search function can be found on individual youtube channels. The big purple arrow points to it. As I mentioned in our last newsletter we welcomed many Millers (Jesus’ family) to our home early on in July. They stayed with us for a little under a week and there were some interesting discussions had. It became really clear early on that the other Miller’s desires (apart from those of Tristan) were in line with a lot of small talk and façade and there were definite attempts to control what topics of conversation were allowed. While Jesus and I are happy to chat about what people have been up to, what environmental projects we have going on, and even topics like politics, travel, weather and current events, there are times when we, through the simple expression of being ourselves, bring up issues like emotions, and past family events. Our guests weren’t happy with that and so in the end at our request they, with the exception of Tristan, left our company a few days early. While I had some personal emotions to feel about their desire to control us and attack Jesus, Jesus and I had some great discussions after this all happened. People who don’t value or want truth live in façade. These people, through their resistance to truth, also exert severe pressure on the people around them to not be truthful about who they are, what they want, and attempt to force people to accept everyone’s façade. People who don’t want to be humble towards their feelings and who don’t want to love are going to punish the people around them for their unresolved issues, live in addiction and not be concerned about treating others with a lack of consideration, respect or love. Our desire to only form close relationships with people who have the three qualities I listed above applies irrespective of whether a person is a blood relative, their partner or an old friend. Worldly expectations – familial or otherwise – no longer apply. Conversely any person, whoever they are or how I meet them, if they are someone who is humble, who speaks truthfully and desires to love then I’m interested to get to know them. They don’t have to share my belief about God, the Universe or even who we are. If someone has those three qualities then, in the context of a relationship, they can be trusted to treat me well or at least work things out without the need for condescension, attack or bullying. Jesus once talked to me about some of the states we can live in when it comes to expression of self. One is that we ‘give ourselves away’. When we give ourselves away, we relinquish our personal desires and aspirations in favour of what other people want, we alter our personality to suit our environment and we are compliant to the whims and wishes of others. Another state is that we ‘be ourselves’. In this state we are real and open about who we are, what we want and what we feel. We don’t force ourselves, or our beliefs upon others but we don’t hide these things either. Being ourselves means giving up our façade and simply expressing our nature through our actions and in our interactions. To be ourselves at all times, with everyone, is loving. A third state is ‘sharing ourselves’. When we share ourselves we go beyond just ‘being ourself’. Sharing ourselves means desiring and allowing ourselves to be known, sharing what we deeply feel and desire. We can share ourselves in loving, though different ways, through soulmate relationships and friendships. We are always going to end up in pain if we choose to share, or try to share, ourselves with people who don’t want to know us and who do not love or desire to love us. In other words attempting to share ourselves with someone who can’t be trusted to love us is not taking good care of ourselves. Equally attempting to share ourselves with someone who clearly doesn’t want to know us is only going to lead to disappointment and this kind of desire is usually led by addiction. However, choosing to share ourselves with people who do love us and care about our welfare is very rewarding and encourages growth. While being ourselves all the time is loving, to be selective and discerning about who we choose to share ourselves with is also a sign of love and development. So, I have been reflecting on and feeling about these three states of being myself for some time. Having Jesus’ family gathering was a great way to bring a lot of things into clear focus for me. In the wake of it all I’m excited to be even more clear and assertive in my desire to only share myself with those who love, or who aspire to love through being humble and embracing truth. During the drama we both fell ill with a throat, chest, and head flu. Neither of us has been that sick for years but gladly as we worked through things we got better again. Jesus and I have also been working on some relationship issues that I feel really positive about. I should probably say that we are always working on the betterment of our relationship but at the moment I feel that I am making some key shifts that will drastically improve our individual happiness and unity as a couple. This is where some of my long term resistance has been and it feels great to make some changes and feel the positive difference. I am beginning to experience the difference between ‘working on emotions’ in order to ‘get through them’ or to ‘solve a problem’ and the true state of surrender. As I start to understand and even experience the state of surrender it feels a lot like changing from a ‘thinking being’, governed by intellect and analysis, who sometimes has feelings, into being my feelings with thoughts, decisions and aspirations that stem from those feelings. It is the allowance and embrace of all of my emotions, all of the time. Not because it is the ‘right’ thing to do or because I want to ‘deal with something’ but because this is who I truly am – a feeling being, a soul with a body and mind. This is the Way that Jesus has been speaking about for so many years. It still feels awkward to try and explain it but as nearly as I can put it right now; surrender is accepting the truth that God created me as an emotional being and my wanting to experience myself as such again. I’ve fought this state for years and years and honestly I observe that almost everybody who hears Divine Truth does this. I’ve come to realise that I’ve been terrified of just how emotional I actually am and I perceived that others would judge and attack this in me. I’ve judged my surrendered state as being a ‘histrionic woman’ who won’t be taken seriously. Ironically I’ve been far closer to histrionics and melodrama in my resistive state than I ever will be in a surrendered state. In fact, surrender is the opposite of being dramatic, emotionally manipulative and over-the-top. When I allow myself to surrender my passions and aspirations are impossible to ignore. Allowing more of my emotions, without being selective, I find that what I want to do and how I want to create is impossible to ignore. That feels great. I sometimes feel scared – how will others treat me when I embrace my love for God to its full degree? – but in this surrendered state even feeling that fear feels good. I find it ironic since I have been telling myself for years that connecting to myself will be traumatic, only leading me to be sad all the time and to realise that I am a terrible person. I couldn’t have been more wrong. So, how does my working on all this relate to our soulmate relationship? Well, obviously my resistance to allowing all of myself all of the time has a huge impact on how Jesus and I can connect. It is impossible for us to be emotionally and physically intimate while I am resisting the experience and sharing of my true emotional self. But even more than that, my judgement of the surrendered state which has stunted my own soul growth has also had an impact on Jesus’ personal progression. My judgement of surrender has caused me to judge Jesus in his surrendered state. I have attempted to control him, a lot of our life, our interactions with each other and with other people in an attempt to prevent my own emotions. I’ve also been quite needy and oppressive, wanting him to share my feelings, validate them, help me avoid ‘making mistakes’ in love and basically tried to consume our life with a focus on me and my resistance. Jesus in an open, emotional state triggers my own emotions which I have wanted to prevent. And I’ve also lived in fear of how both of us would be judged and viewed if we were in a sensitive, surrendered state with other people. I’ve been angry about surrender and withdrawn into my ‘numb’ state again and again in an attempt to avoid the situation. This would lead Jesus to feel that the situation was hopeless and he would have to ask me to either leave or to deal with my emotions. I would then become all ‘goal orientated’ about ‘getting to’ my feelings which is a completely different thing to choosing to live my life as a feeling being. Because of my resistance, as much as we talked about surrender and the Way, I really didn’t get how wrong I was getting it. I would ‘try harder’ to feel rather than surrendering to feeling all the time. I am pointing this out because I believe that there is a valuable lesson here. The truth is that a person who is only interested in preventing their own feelings (like I have been) also has no interest in the feelings of others and actively tries to prevent others from feeling their feelings. That’s the truth and that is what I and anyone who resists surrender will do automatically. Because Jesus was already in the feeling state – he was a feeling being – when I met him it has been pretty exhausting for both of us living together. In effect I have been fighting my emotional self and fighting him on being himself every day. Whether voiced or not, there has been complete emotional disharmony between each half of our soul. There has been a difference in our states – one of us in a state of desire to live in the soul, the other in a state of desire to control the soul. Jesus has been trying to address this difference with me for the longest time and I’ve been trying to ignore it. I haven’t really wanted to understand it because it challenged my sense of control. This is a more pronounced effect than that of two people living together who are both resisting surrender. These two people are actually helping each other to avoid surrender and so there is no conflict between their states of being. Jesus’ sensitivity to my judgement, along with my overt and covert attempts at outright control of him, has made it difficult for him to remain in his previously surrendered state. Because of the extreme amount of pressure I placed on Jesus to conform to my non-feeling state Jesus has found it extremely difficult to feel any emotion while in my company. This has meant us sleeping apart for very long periods throughout our entire relationship, the latest period being 18 months. For Jesus sleeping together has seemed impossible since it feels like there is a soul based argument going on 24×7. As we continue to work through this issue Jesus has been reflecting on his invitation and allowance of me living with him, in a state so opposed to his own, for so long. He presumed that me saying that I wanted to progress meant that I was desiring to live The Way. When in fact, despite what I may have been telling myself, I have been in direct opposition to surrender. I have wanted power and control over my emotions and the only way I was going to get that was to have power and control over my partner and to have him feed my addictions. My over riding projection has been ‘don’t do anything that will trigger my emotions’ because I believed that being an emotional being 100%of the time would remove my power and expose me to some sort of harm. In this state I turned every confrontation of my emotions into a competition or a power play. Any person in an unemotional state who wants to stay unemotional will always feel and behave this way. Judgement of and desiring to control our emotions makes us view open emotion and honesty in another as a threat to our value, worth and power. The truth is that surrender feels like the opposite of powerlessness. It is the end to competition. In this state emotions don’t feel like a sign of weakness but a beautiful experience of self. There is no judgement of what is felt only aspiration to experience it. And through that experience we can heal. This much is clear; for a loving relationship to survive both parties have to be feeling beings. Jesus and I really want to talk about all of this in more detail in future presentations because this change in state is the key to living the Way and knowing God. Although Jesus has spoken about it many times before I notice that just about everyone who has heard Divine Truth is still struggling to even want to make this transition. So I feel that anything we can share that might encourage, inspire and assist people in this area is worthwhile. Thank you again to everyone who has donated to us over the past month. I feel incredibly fortunate to be able to live my passion to share Divine Truth with the world and each of you help to make that possible. I hope that you are all experiencing your own growth and changes and that life is rewarding for you. This entry was posted in Family Relationships, Soul Mate Relationship, What We're Up To and tagged be yourself, Divine Truth, family, humility, Jesus, Love, Mary Magdalene, soul mate relationship, truth on August 4, 2015 by Mary. “Our Father provides the substance, or mechanism for us to know him, which is Divine Love, but for us to receive that Love we must truly and sincerely have a burning desire to know Him and love Him. This entry was posted in Change, Humility, Inspiration, Jesus Quotes and tagged AJ Miller, God's Love, Jesus, Longing on February 5, 2015 by Mary. The sad truth is that the entire world’s population lives in fear in some or all aspects of their lives. Some of us acknowledge some of our fears some of the time. But seeing our fear doesn’t mean that we deal with it healthily. In fact, most of us feel justified in our fears and demand, be it covertly or overtly, that our environment and the people in our lives make allowances for our fear driven limitations. Then there are those of us who live in complete denial of large amounts of fear about any number of things at any given time. Denial is a perceived sanctuary and many people reinforce the barricades of the castle and pull up the drawbridge over which truth may have passed. Routines and addictions mask any sensation of fear, numbness becomes the norm, and even though the supposed ‘sanctuary’ can feel cold and damp at times, the real issue of fear is never mentioned and life is branded as normal. We deny or diminish what scares us because in our souls we are actively resisting and suppressing the sensation of fear. This is how we choose to use our will. And to aid us in the quest for avoidance we choose and create addictions, and attract relationships to help us navigate our days and unless we are sensitive or aware we rarely notice that the way we are, the way we do, the way we be is less about our real self and more about the escape from fear. This willingness to live in fear is an affliction that inhibits growth on a global scale. It removes us from our true selves, it creates illness and suffering, it limits joy and discovery. And yet, I notice that most of us, when faced with this simple truth, wish to deny responsibility for our choice in this matter. We might acknowledge the affliction but want no part of the cure. We resist the truth that living in fear and its multitude of negative consequences has come about through the exercise of our own free will. What Does It Mean “Living in Fear”? Living in fear or living by fear is very different to feeling our fears. Living in fear means that we allow the fear within us to guide and dictate our actions, our interests, our relationships, our work, our pleasure, the clothes we wear, the food we eat, the programme we watch on TV. Every action, inaction, decision and indecision is made with the direct purpose of preventing the experience of fear. In other words, we are constantly responding to fear rather than simply allowing ourselves to experience it as a feeling. Fear becomes our evil task master – literally. It is very difficult to know and discover our true selves when we live in fear since in this state our desires are limited to things that do not trigger fear. What we commonly associate with the sensation of ‘happiness’ is actually a lot more to do with a sense of relief at avoiding fear and having addictions met than any pure experience. The truth is that as we suppress fear we simultaneously strangle desire and most of us, most of the time, prize the avoidance of fear above the exploration of our wildest dreams and deepest passions. We rarely pause to consider what we would be interested in or inspired by if fear was not a daily part of life. And while living in fear can come to feel routine and normal it actually requires a great deal of vigilance, effort and control. Whether we realise it or not, when we live in fear all our systems are alert and geared towards its prevention. We walk through life sapped of our vitality and never experience our full potentials for energy and creativity. Living in fear ages us and limits us. But even more than that, because we honour its prevention above anything else, fear becomes our God, our ruler, the dictator who drives our decisions and assessments. In this state, we are apt to abandon morality and ethics and even rational thought if it means that we can allay fear. In other words, unless we are willing to be humble to the feeling of fear we will become horrible, unloving people when fear is triggered. Living in fear damages not only ourselves but the world and the people around us. It is the reason we stand idly by when bad things happen. It means we bow to the threats of people who are clearly unloving, thus lowering our own condition and the potentials for love in the immediate environment. The nursing and retaining of fear is one of the major causes of all evil and unloving behaviour in the world. Living in fear keeps us silent and inactive when love would compel us to speak and to act. Living in fear means we begin to prefer error to truth. While we justify not feeling fear we are automatically going to be unloving and contribute to the evil in the world in our daily activities and through our interactions with others. There is always a choice between humility to fear and the resistance to and suppression of it. And each time we choose suppression and resistance we employ means, methods and emotions that are out of harmony with love to do it. We purposefully choose to use our will to NOT love, to NOT be ethical, to NOT be truthful, to NOT be moral, and each time we do this we are seeding evil on this planet. Unfortunately we do this everyday. And when we commiserate with fear and make allowances for the fear in others we only continue to foster conditions that lead to more evil and suffering. We suppress our desires. We might say things like “I don’t know what my passions are”, “I’m not sure what I truly desire or want from life”. We have difficulty making decisions. We procrastinate. We deny the need for action in our lives, we resist change. We make jokes about our fears or the fears of others. We make fun of people who display fear. We obsess about how others view us or how people feel about us. We live in denial and resort to wishful thinking about our progress and personal development. Note: There are many more signs that could be added to this list. These are just some examples. Most of us are in denial of just how many things frighten and terrify us. I used to exist largely oblivious of what frightened me. I just didn’t think about it, instead I acted to avoid it and I had addictions that helped me do that. Coming out of denial can happen as we attract events that make it impossible to deny fear any longer, like say meeting your soulmate who is Jesus (smile). Or we can take a more pro-active approach by examining our lives truthfully. This includes physical avoidance of situations, people and events. It also refers to (perhaps) less obvious avoidances which include every attempt we make to minimise, justify and shift the blame in relation to our fear. This includes control and manipulation of our environment, other people, our children, animals, and spirits. Any time at all that you have the desire to control or influence the will of another away from what they truly desire you are acting in fear rather than feeling it. This includes any sense of frustration, annoyance or irritability all the way up to outright rage, verbal and physical violence. Examine the situations, habits, events and relationships which you either avoid, attempt to control or that trigger your anger. In every case you will find that you are living in a fear. We can live in fear and avoid all awareness of our feelings by meeting addictions and controlling our experience and environment. But even after gaining an awareness of our fears, we can continue to live in them if we carry on doing as they command. We can be aware that we are afraid of certain things but if our physical and emotional choices are still motivated by the desire to prevent the actual confrontation of fear no soul change has occurred. We will continue to live in fear unless we begin to make choices to challenge the messages fear gives us. I notice many people who say that they have decided to ‘feel their emotions’ are still basing their life choices on fear – which demonstrates that they are not yet challenging their fears. The scope of their lives, limited by fear’s dictate, does not expand and this is proof of living in fear. Another way I notice many of us not shifting into releasing fear is that we begin to have a sensation of fear or anxiety, but then not let it overwhelm us completely. Many people live in a constant state they call feeling afraid but are actually just living in fear. While we try to keep the feeling at bay like this we aren’t truly experiencing it and therefore fear won’t dissipate. While it’s important to recognise the problem of fear and even write a fear list, don’t kid yourself that self-awareness means soul changes. Becoming more aware of our fears and deciding to ‘feel our emotions’ doesn’t mean that we have stopped living in fear. Then in order to change, start to do the opposite of what fear commands, seek ways to challenge fear and, surrender to the experience of the fear that comes as a result. In order for fear to dissipate it must be experienced emotionally. There are no shortcuts. 1. Always allow the experience of it. 2. Do not go ‘out of body’, do not go away from the experience, do not try to run away. Going ‘out of body’ only allows spirits to take over the body, and running away only increases the fear. 3. Deep breathe all of the time during the experience. Never stop breathing diaphragmatically. This assists you to stay in your body. 4. Have faith in God, and pray for God’s assistance to not only stay in your body, but also to help you go through the experience. Always pray from your heart. Fear when left unchallenged pervades our life. By living in fear we are agreeing to the lie that we really do have things to be afraid of and that love is not the most powerful force in the Universe. Sadly, the more we tell ourselves these falsehoods and live our lives according to them, the more fear grows. By avoiding dealing with fear we are avoiding the potentials that love and truth can bring to our lives and to our planet. Conversely, as soon as we stop living in fear, it will begin to loosen its hold on our lives. We begin to feel more freedom and joy. We make room for Truth. As we begin to experience fear this liberates our true self and opens up our heart to desire and possibilities previously subdued. To overcome fear I believe it is necessary for each of us to recognise the individual power for change that God has granted us through the gift of free will. We can harness that gift, and use our will to love. In fact, it is only through the engagement of our will in opposition to the fear that we currently allow to govern our planet and our lives, that deep, true and lasting fulfilment becomes possible. And through this same use of will we cease supporting the fear in others, which actually assists them towards the possibility of personal fulfilment as well. Fear fights for itself, it justifies inaction, and it makes us experts at excusing our lack of love. Unless we challenge fear and the hold we’ve given it over our lives, we have no hope of change. Even the smallest choices made in fear send ripple effects that impact not only ourselves but our environment, our children and those people around us and carry on for longer and in more ways than we can currently conceive of. And each time we make these fear-based choices we reinforce fears commands, we live in the lie and we create more inertia to challenge and confront when we do finally decide to choose love. We are exercising our will to make choices in relation to fear minute by minute, day by day. The cessation of life lived in fear does not depend on any external circumstance, event or person. It is in our hands alone and depends upon only one thing – the personal choice to cease listening to fear and instead to use our will in the direction of love, truth and ethics. Without making courageous choices that grow integrity to principles such as these, feeling emotions is not only useless but the emotions felt are not those which will heal us. Yet when we are willing to be steadfast and humble as we challenge fear, emotions will begin to flow from us. Change will happen. I encourage you to examine your choices- these precious expressions of will. They can be your catalyst for change and growth or simply a manifestation of excuses made to live in fear. This entry was posted in Change, Cliff Notes (on fear), Fear, Jesus Quotes and tagged AJ Miller, Change, control, denial, Divine Truth, emotional release, ethics, evil, Fear, Jesus, living in fear, Love, truth on June 25, 2014 by Mary. “You have been reading a book which is not true for there are no hells as described in it, where mortals after passing into the spirit life have to undergo such sufferings and torments. There are no such places as described in the first part of the book. You need not believe that there are any such places of punishment for the evil spirits. God loves all His children too much to have them pass through such experiences as are in that book described. Over the past six months, Jesus and I and others have been filming clips for the Frequently Asked Questions Channel. Back in April we focused on questions from Christians. I am so grateful for these questions and the chance to participate in generating useful answers to them. One FAQ I particularly enjoyed was about the existence of hell. In fact I was enjoying the discussion so much, I actually forgot that I was supposed to be the interviewer and just generally joined in with chatting. So, I talk a lot more in this clip than I usually would! If you’d like to check out more clips on the topic of the hells – here’s a link. This entry was posted in Padgett Messages, Relating To God and tagged AJ Miller, Christianity, Divine Truth, heaven, hell, Jesus, Mary Magdalene on June 12, 2013 by Mary. If the physical universe is striving towards order, could not it also be the case that the other parts of the universe, not seen by man, the spiritual and soul parts, the other dimensions proven by mathematics to exist, are also striving towards complete order and harmony, not just in a physical context, but also in a moral and spiritual context? Would it not make sense that if we desire to know the truths about these things as yet unseen by the eyes of most people in the material world, our highest priority should be to find out how to go about contacting the Source of such things, the Creator of this universe? To contact Him, all we need do is have a soul longing for His Love, and, if that longing is sincere and we have a desire to experience emotions, then our Father’s Love will flow into us, and we shall feel it. Finding God is simplicity itself, so simple in fact that the majority of mankind, mortals and spirits, overlook the only method we have of ever finding Divine Truth, which is made possible by two things; the sincere desire of a man to seek for and feel God and His Love (which we call Prayer), and the overwhelming Passion of God to give all His Children His Love, and have all of His Children come to know Him and experience the joy and happiness of Living in His Love. This is the Greatest Experiment, and when any person tries it, the experiment often begins tentatively, but ends in complete certainty. God is Reality, and the Love and Truth that comes from Him is Real. When we try the Greatest Experiment, we at that time also begin to live in Reality. So my brothers and sisters, live in Reality, in our Father’s Love, seek for it, and desire it above all else. Seek first His Love, and all the other things will be added to you. Although the contents of this message may be well known to you, I hope that you have enjoyed a reconsideration of this information. The text above is an excerpt from ‘The Greatest Experiment’, a document written by my gorgeous soulmate some years ago. If you would like to read it in full, click here. What is the greatest thing in all the world? 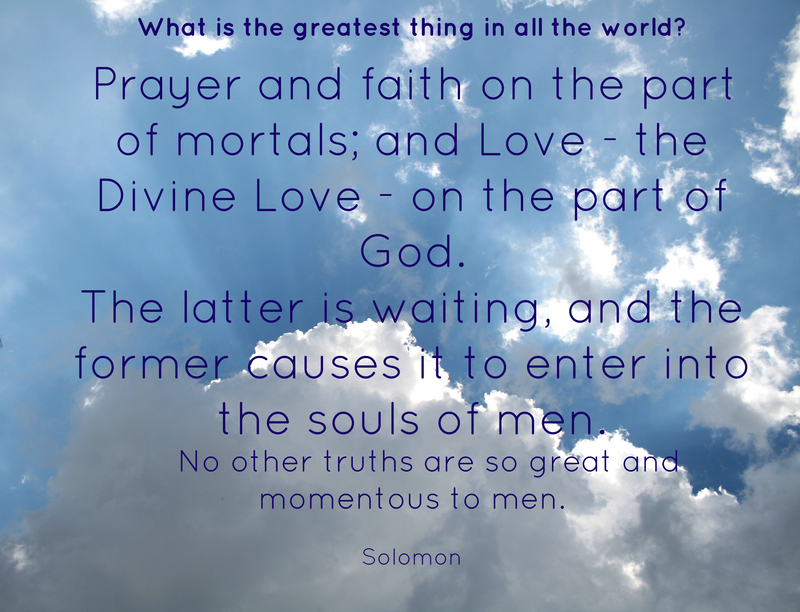 Prayer and faith on the part of mortals; and Love – the Divine Love – on the part of God. The latter is waiting, and the former causes it to enter into the souls of men. No other truths are so great and momentous to men. Let what I say sink deep into your memory, and try the experiment. I know you do try, but try and then try and never cease trying. Love will come to you and with It faith, and then knowledge and then ownership. I could write for a long time, yet, but I must not as you are tired. So with my love and blessings, I will say good-night, and may the Father’s Love take possession of you. For further discussion of the Prayer for Divine Love see this document, or this playlist on our youtube channel. If you would like to read all of the posts in the “Great Experiment” series – click on the “Walking the Way” tab above, then on “Relating to God”, and finally “The Great Experiment”. Scroll to the bottom of the page and read bottom to top for posts in chronological order. This entry was posted in Padgett Messages, Relating To God, The Great Experiment and tagged AJ Miller, Divine Truth, Jesus on May 25, 2013 by Mary. I’ve often jokingly said to others that I’m the poster girl for ‘What not to do’ on the quest for Divine Love. I certainly lived in rebellion for a long time after I met AJ again, and I’ve made more than my fair share of mistakes along the way. Most of these I’ve spoken about publicly, at seminars and on video recordings. I’ve never been proud of my troubles and unlovingness, but I’ve always felt passionately that, if my sharing could help someone else avoid the mistakes I’d made, then I wanted to speak up about it. I’ve told most of you my deepest shames and biggest errors. It hasn’t always been easy but my feeling that it was important pulled me through. That is why lately, I’ve felt strange and somewhat mystified as I’ve sat to write about my personal experiences with the Great Experiment. I find myself shaky, and emotional, and at a loss for words. Its strange because this time – the news is all good. God is showing me so many things through prayer. There I go again, all teary and lost for adjectives to tell you how amazing this journey is turning out to be. At first I thought my troubles with writing were because I don’t think its quite possible to put the power and beauty of God into words. Which is of course true. But that didn’t really explain the difficulty, since the things I want to share are not so much about God but the personal changes I’ve experienced though engaging the Great Experiment in its simplicity and with sincerity. – I’m embarrassed by my hope, my faith and my passion for God. I’ve found a deep well of judgement bearing down on the childlike feelings in my heart for God and His Love. So much so that it seems to have the power to stop some words dead in my mouth, or on a keyboard. Basically, I’m so passionate about the beauty and possibility that a relationship with God offers every single one of us that I’m afraid of being judged as childish and naive. So I skip ahead and judge myself. – The thought of sounding all sweetness, light and no substance, also bothers me. No sooner had I prayed my desperate prayer, than I remembered about a zillion times when, through a lack of confidence or in a state of nervousness (read: sheer terror) or simply because I just didn’t get the lesson at hand myself, I’ve done exactly that. That is, I’ve been vague, spoken in half sentences and danced around the truth with the wistful hope that people will read between the lines and miraculously extrapolate what I mean. Not to mention the times when I’ve been all caught up in what I like to call my ‘poetry of pain’ injury. The poetry out of pain injury is somewhat embarrassing to me, and has its roots far, far back in my family line. It looks a lot like ‘valiantly suffering for a cause’ and/ or ‘living in the drama of the hardship’ rather than just having a good old-fashioned cry about it and moving on. It’s about romanticizing sadness and metaphorically making very bad Shakespearean ‘poetry’ out of the pain. At those times I’ve actually displayed the path and the truth about emotions just completely wrong. So bummer for me (and you who tried to understand what on earth I was on about at those times). I’m trying to mend my ways. – But most of all I’ve found that I’m afraid of people trying to punish me for my joy. Holy Toledo, did that one come out of left field. Definitely an emotion that deserves some more attention from me. As yet, its still very raw and mysterious. I tell you – this Great Experiment is the gift that keeps on giving. Engaging it and then attempting to tell you about it, has opened me up to so many emotions. I’m learning awesome things, and I’m receiving Divine Love. For the first time in five years I feel at peace with my life. (There you go – I got some of that out). Anyway, the real reason I’m writing today is to introduce to you the next in our series of discussions of Padgett Messages that fits into our Great Experiment series. The message we discuss is from Solomon, and its my favourite. In fact, I was so moved by this message and our discussion that we had to stop tape twice so that I could go and have a sob in Lena & Igor’s loo. Seriously. However, since I seem to have prattled on so much about my own injured stuff in this post, and I don’t want to mar the beautiful tone of the actual message and video discussion, I’ve decided to post the video links in a separate post. I know that might seem crazy but Solomon needs his own space. Check out his simple yet awesome message, in full, in the next post. This entry was posted in Prayer, Relating To God, The Great Experiment and tagged AJ Miller, Divine Truth, Jesus, Padgett Messages, Solomon, The Great Experiment on May 25, 2013 by Mary. Below you’ll find a video discussion that’s a part of our new series discussing the Padgett Messages. I really enjoyed this chat between Jesus and I. We talk about the message received from Joseph Salyards on 3rd May, 1915. If you would like to read along with the Padgett Message as you watch the video, click here. The message will open in the next tab of your web browser. In this talk we touched on many of God’s Laws and I fess up about my rebellion at one of the most important Laws to understand while on earth. As a self-confessed rebel, coming to love God’s Laws has been a drawn out process for me. Lately however no-one is more surprised than me that exploring, discussing and experimenting with individual Laws is developing into a sort of personal love-affair. After this discussion I had the idea to offer you a self-reflection exercise. I completed it myself and thought you might be interested! Here is a list of movies that demonstrate characters who encounter the Law of Compensation. Did you ‘recognize yourself’ in any of the characters? For example have you had common feelings, attitudes, or experienced similar events to anyone in the movie? Without analyzing too much with your intellect – Do you feel that the main characters in this movie did the ‘right thing’? If you do, what actions did they take that you agree with? Would you, or have you taken similar actions? If you don’t agree with the actions of the main character/s, why not? If you have seen any of the movies before, have you previously considered that they each demonstrate a person encountering the Law of Compensation? Did you feel that the behaviour of the characters displayed repentance? Did you feel the actions of the main character were noble and just? I found it most powerful to simply let myself feel my response to this first set of questions. My emotional reactions tell me most about where my soul is at in terms of fully understanding the principles of Divine Love and Truth involved. Later on I came back to use my intellect to analyze where my injuries are still showing through. For example, as I watch the movie I might emotionally identify the sacrifice and hiding of truth of certain characters with them being loving and honourable. Its great to let myself feel that. When I come back and analyze that reaction intellectually I can see that its a false belief in my soul that will effect my relationship with God, and ability to truly love others. I wouldn’t have learnt that if I’d only analyzed the movie intellectually and with a view to getting the answer ‘right’. These first questions were designed to help me self-reflect and learn about myself – so by definition the only ‘right’ answers were honest answers. The second lot of questions (below) helped me to see what I really understand and believe the Laws of Compensation and Repentance/ Forgiveness to be. How did the main characters in the movie begin to encounter the Law of Compensation? What happened? How did they feel? How was the Law beginning to work upon their soul? How do the characters respond when they start to feel the effects of the Law of Compensation? Which characters fight the Law when it begins to act on them? Did any character move from experiencing the Law of Compensation, into a process of repentance? Reflecting upon your knowledge of God’s Laws and Love, and the true nature of the human soul, do you feel the main character developed or degraded their soul condition through the events portrayed in the movie? If you feel that the main character developed in love, did they do this via engaging the principles of the Natural Love or the Divine Love Path? I hope you enjoy the self-reflection exercise if you choose to do it. If I’m super organized I’ll do a follow-up post, summarizing my observations and reflections about each movie in relation to the Laws of Compensation, Repentance & Forgiveness. Have a great day everyone! We’re in Kyabra for the week and it’s great to see how all the projects from last year’s Summerfest are going. This entry was posted in God's Laws, Padgett Messages, Practical Exercises, Rebellion, Relating To God and tagged Divine Truth, Free Will, Jesus, Law of Compensation, Padgett Messages on April 20, 2013 by Mary. Since I subscribe to our Divine Truth Channel as well as our FAQ channel, which now has an entire playlist on cults, one of the videos recommended for me was “I Escaped a Cult” (clip below). I watched the clip. I wept for these people. I felt about the reasons why people are drawn to cults. I prayed for the healing of those I saw on film and all others who are damaged by such horrible acts and erroneous belief systems about God and Love. It wasn’t until I was finished with all that watching, feeling and praying that I suddenly realized that loads of people assume that my life is similar to those of the people described in the documentary. It also dawned on me that people might even think that we treat people like the ‘leaders’ in these groups treated the people who told their stories. Its true that the false, slanderous, misleading and sensationalized media coverage of us in recent years has encouraged people to think in such ways. But I am also aware that many would assume these kinds of things simply based on our identity claims. Now you might think I’m a little slow on the uptake when it comes to considering how others perceive us. Truth be told, I have (of course) considered it all before. But given how different my life actually is to what the media has said about it, and given that I actively spend everyday attempting to grow in and extend love, truth and humility to others, and given that I am adored, encouraged and inspired by the man I live with, its easy to forget that people think that I live a tortured, power-hungry life with a narcissistic megalomaniac. So extreme is the contrast in viewpoints that the latter assumption can be swiftly dismissed by my heart and mind as utter absurdity (and is thus difficult to retain). Put simply, such slander is so daft and uninformed that I don’t think about it much anymore. And I sometimes forget that many people are actually holding onto the daft, uninformed and absurd ideas about who we are and what we stand for. So at times I still feel suddenly very shocked and naive when I watch these types of documentaries and realize that this kind of abusive behaviour would be associated in the minds of others with my life or belief systems. You see, we are all about assisting people to end their acceptance of abusive and unloving behaviour. We teach the embracing of free will and that to receive Love from the One Absolutely Reliable Source is the surest way to happiness and growth – no intermediary necessary! We preach that God is not One who punishes or requires penance in order to receive His Love, nor is any person more important or powerful in God’s Eyes than any other (so if we live in harmony with God’s Laws we would never be able to view each other in terms of hierarchy or to set up abusive power systems on Earth). In short, we are the most anti-cult people I know. I’ve written about this subject before, and I was considering writing about it again yesterday. But then Jesus had an email requesting an interview/ opinion on cults and he wrote awesome things. So I’m just going to share his words after the clip of the documentary below. I know that if you read my blog regularly you might be scoffing at the necessity for me to write about such topics. You’re know you’re not a member of anything and you are completely relaxed in the knowledge that you aren’t in a cult, right? Well, in my opinion and experience its always good to explore emotions around such topics. They are sensationalized in our media and our lives because many people – no, most people – harbor huge fears about being controlled, manipulated and hurt. (Jesus discusses this in more detail in the text below). While we deny and suppress these fears, they have power in our lives. Fears of being abused, controlled and manipulated, when left unhealed and unchecked, can cause us to be needlessly suspicious of good people, and/or foolishly trusting of people with bad intentions. They are the very fears that people who want control use to manipulate us e.g. they accuse us of being controlled and manipulated in order to have us change to what suits them or to fall back under their control. It can sound like a complex issue, and honestly unless we explore our doubts and fears things can become complex and confusing. Thankfully if we are willing to delve deep into our feelings, ask the tough questions, and feel our pain of past hurts and manipulation, we do emerge with the clarity to discern who and what is trustworthy. If we involve God in the process, we also learn what Love truly looks like. With such knowledge we can never be fooled by dubious characters, peddling false teachings and tainted ‘love’. Excerpt from a Response to a Media Request for an Interview Regarding Cults. No matter what you have heard from other members of the media, we do not have a religion or a cult. All Mary and I do is speak at seminars we provide for free, provide information for free over the internet about Divine Truth, and share Divine Truth with anyone who questions us where possible. Just because we claim that we are Jesus and Mary Magdalene, it does not mean that we fit your assumptions of what persons making those claims would normally be like. We do not have any person staying with us where we live. We live on a 40 acre private property that I purchased quite some time ago when I was still computer programming. No-one else lives with us. We have no experience of living in a cult, and we are not “cult leaders” as the media has falsely claimed, we have no “following”, we do not interact with the same people on a day to day basis, we do not manipulate and control people, since that is against our teachings of love and the honouring of the free will of the individual, and so I could not provide you with any perspective on the matter aside from my own opinion. I have also placed my comments about Cults on our Divine Truth FAQ YouTube channel for anyone who wishes to see the truth about what we do, along with my general comments about cults and cult leaders as well. I do feel that many cults on earth are quite destructive, but I also feel that there are many institutions on the planet that are just as destructive in their teachings, because they are not based around love. I include some orthodox religions, economic institutions, political movements, and other professions amongst these destructive institutions. As I said, anything that does not honour the free will of the individual, promote the exercise of love in our day to day life, and allow for the discovery of further Truth, scientific and otherwise, is destructive. I have a lot of compassion for people who have been a part of cults, and I do completely understand why people are attracted to them. I feel these attractions begin often because of the unloving treatment of parents towards their children, and this makes their children susceptible to the influence of self-installed “authority” figures when they become adults. In addition, many claims are made in the name of God, and people are even encouraged to go to war, and perpetrate violence, for the sake of their “Gods”. This is all cult-ish behaviour on the part of the people encouraging such actions. I have spoken of these things in my Divine Truth FAQ channel. I feel that the general population has a huge amount of fear regarding “cults”, and they bring this fear, which I believe comes from their childhood, and their experiences of being controlled and manipulated by society as children, into their adult life. As adults, we usually operate either in agreement to, or rebellion of, unhealed emotional issues from our childhood. This means that we are either attracted to persons who are “cult-like” authority figures, or we could say more like the impression we had of our own parents, or repelled by and afraid of such persons (and sometimes have both reactions at different times, just like when we were children). If I, within myself, felt secure in my own search for truth, and honoured my own free will to make choices and decisions for myself no matter what other people in society or my family or friends generally thought, and understood what love really acted like, and could determine when someone was truly unloving in their actions towards me, then I would not feel the need to either follow a “cult-leader” or fight against one. I would feel secure in my own choices and decisions, and I would be able to change my mind at any time. I would not listen to anyone who manipulates me or attempted to manipulate or control me through force or threats, since I would see such an action as harming my own free will choice, and being out of harmony with love. A person with conviction in their own belief system will be firm for what they believe, but they, if they were loving, would never force (either verbally, emotionally or physically) their belief system upon me, and require that I change my own belief system without applying logic and love to the analysis of the belief system they are sharing. They would honour my ability to choose for myself what I wish to believe, even if it disagrees with their own concept of what is right and true. Most religions do NOT do this. They instead attempt to force their beliefs, along with the threat that God will destroy or punish me at some time in the future for having the wrong belief. I feel that God does not punish us for wrong beliefs. I feel that the only penalties in the universe are for acting out of harmony with Love, and so, people who attempt to force me into a belief system are acting out of harmony with love and will eventually feel the weight of their own unloving actions. The pain and suffering in this world are the direct results of society acting out of harmony with Love. I also feel that society has many false beliefs surrounding what is acceptable when we are a child, compared to what is acceptable when we are an adult. For example, the average Christian believes, as the Bible states in Proverbs 13:24 “Whoever spares the rod hates their children, but the one who loves their children is careful to discipline them.” For the average reader of this verse, it justifies spanking the child, or acting violently towards the child, in the name of “love”. So, many people feel justified in hitting their own children as a result, as a form of “discipline”. But if we hit an adult with a stick or even with our hand (even with the intention of correcting them), government law in most Western nations views that as violent assault, for which we can be incarcerated. So, a violent and terrifying act towards a child is tolerated by society (for many reasons including the parents concept of “ownership” over their child, and the acceptance of religious books that promote violence), and, at the same time, the same action perpetrated towards an adult is called a violent crime. This is a measure of the hypocrisy of society, allowing a violent action towards a child who cannot protect itself from such an act, while at the same time attempting to protect an adult who experiences or is threatened by the same violent act. The result of this is that very few people have a correctly aligned “compass” when it comes to determining what real Love would do. Unfortunately there are many times when we are tolerant of what society calls “heinous crimes” towards children, for many reasons religious and otherwise, and I have only provided one example. These crimes are not tolerated towards adults. Of course, when those children grow up, it makes sense that their own concept of what love is will be severely crippled, and therefore, it becomes difficult for them to determine who actually loves them, and who is just making statements of “love” without any real love being present. It causes them to be open to people who use many words of “love”, but who do not have loving feelings or actions. It opens them to concepts that are flawed when examined by love, and they readily accept such flawed concepts, since those same concepts were forced upon them as children. It will also be very difficult for them to correctly reason about whether the group of people they are becoming involved with actually promote really loving teachings and actions. As you say, society must learn “where to draw the line”, and I feel the line must be drawn by the thought I mentioned in my previous email to you, and that is; “anything that does not honour the free will of the individual, promote the exercise of love in our day to day life, and allow for the discovery of further Truth, scientific and otherwise, is destructive,” and needs to be corrected. This line would apply whether the problem is exposed within a family, within a community, within an organisation, within a religion, within a government, or within a country. If this line was consistent in all circumstances, then each individual, including children, could feel safe to explore the world and continue their own quest for truth without fearing potential violence, control, manipulation or any other act which would harm its own expression of free will. Then all of us would feel comfortable in the world, whether we had different belief systems or not. What I am suggesting is that eventually we all need to agree about what is loving behaviour, and what is unloving, and make a personal choice to live in harmony with what is defined as loving. But this will need to be done with logical and reasonable discussion, not with emotive belief systems that have no bearing on logic, not relying on books (religious or otherwise) written hundreds or even thousands of years ago that are obviously flawed when we examine them from the perspective of love, or by reverting to character attacks of others just because they have a different opinion to ourselves. Just my thoughts towards the discussion for what they are worth. You can check out more from Jesus about cults here. He’s so wise my guy. I love how relaxed and jovial he is answering questions about cults! Every media outlet I’ve encountered accompanies such discussions with ominous, foreboding music. Jesus just cracks a smile and answers without hesitation or fear. This entry was posted in Fear, Free Will, Growing Great Soul Qualities, Humility, Jesus, Jesus Quotes, Media, Trust, Truth, What We're Up To and tagged Cults, Fear, Jesus, Media, National Geographic on April 6, 2013 by Mary.